February – the month for love! What better way to show your furry friend how much you love them than by contributing to a clean, fresh, and healthy mouth. Periodontal disease is no joke. Our pet’s dental health and oral hygiene is extremely important to their overall health. Dental problems can cause or be caused by a myriad of other health problems (abscessed teeth, pain, bone infections, and possible life-threatening internal organ infections). How much do you know about your pet’s dental health? Test your knowledge by taking our dental heath quiz, then check back here to get the answers and all you need to know to keep your pet’s mouth as healthy and fresh as can be! 1. True or false, most dental disease occurs below the gum line, where you can’t see it. True. While tartar and plaque does occur above the gum line and on teeth, it can easily be seen and removed on a regular basis (through brushing!). Tartar and plaque buildup that can’t be seen (below the gum line) can cause infections and damage to the jawbone and tissues that connect the tooth to the jawbone. That’s why regular dental checks and thorough cleanings by our veterinarians are so important. We are able to get an accurate assessment of the health of your pet’s mouth and see if underlying dental disease exists. 2. What is the single most effective practice you can do at home to keep your pet’s teeth clean and healthy between checkups at LVH? Brushing daily. Regularly brushing your pet’s teeth is the single most effective thing you can do at home between professional cleanings. Brushing your pet’s teeth on a daily basis is the most ideal, but we know that isn’t always realistic. Just brushing a few times a week with a toothbrush (or fingerbrush) and some enzymatic toothpaste can remove much of the tartar and plaque that forms on teeth. Not sure how to brush your pet’s teeth? Ask us the next time you’re in and we’ll show you how. You can also watch Dr. Boyle give a great demonstration on how easy it easy to keep those teeth pearly white at home. 3. What percentage of dogs and cats will have some form of periodontal disease by age 3? 70-80%. Amazingly, 80% of dogs and 70% of cats will have some form of periodontal disease by the time they are 3 years old. Periodontal disease includes gingivitis (inflammation of the gums) and periodontitis (loss of bone and soft tissue around the teeth). Early detection at your pet’s annual exams and regular cleanings are critical in preventing periodontal disease, mouth pain, and associated health problems. Bacteria in the mouth associated with periodontal disease can enter the bloodstream and be carried to other parts of the body, causing problems in and around the liver, kidneys, and heart. At your pet’s annual or bi-annual exam, we’ll check the health of your pet’s mouth and look for early signs of a problem. 4. What are the warning signs of poor oral health and possible dental disease in pets? 5. When was the last time your pet had a dental checkup? If your pet has been in to see us within the past 6 months – 1 year, then congratulations, you’re doing your part in keeping up with good preventative care and oral health for the life of your pet. If it’s been over a year, contact us to schedule an exam with one of our veterinarians. At your pet’s bi-annual or annual exam, we will do a thorough examination of the entire body, including the mouth and gums. We will be able to see any plaque or tartar on the teeth, but a more thorough exam and x-rays may be needed to evaluate the health of the teeth roots and jaw below the gum line. We use general anesthesia to sedate the patient for this exam, taking x-rays, and the subsequent cleaning. 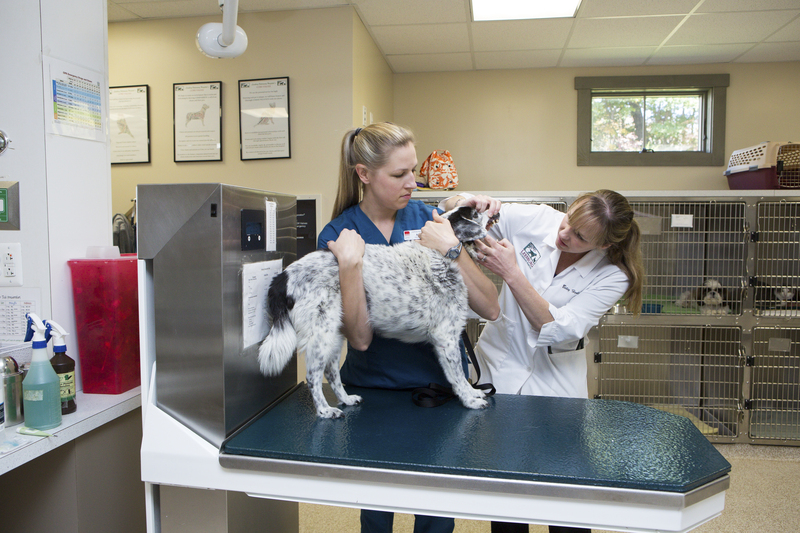 Sedating the patient makes it possible for these procedures to be done with less stress and pain for your pet. With your pet sedated, we are able to get full-mouth radiographs very quickly with our new state-of-the-art digital x-ray machine and the best cleaning possible. 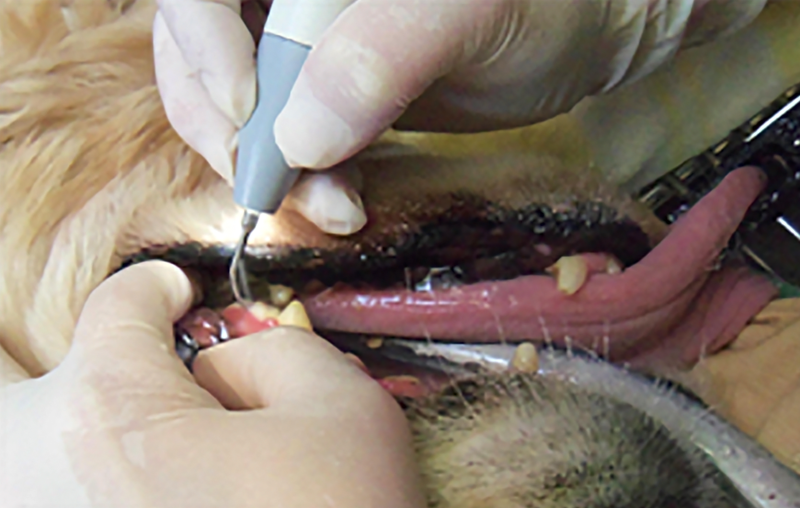 Dental cleanings at Leesburg Veterinary Hospital include hand and ultrasonic scaling, followed by polishing and a mouth rinse, the combination of which is designed to remove plaque and slow its build-up. For a more in-depth look at your pet’s dental day at LVH, check out our blog article here. During a dental cleaning at LVH, your pet’s teeth will be hand scaled & scaled ultrasonically to remove tartar and plaque buildup. For more information on the importance of dental health for the life of your pet, visit the American Veterinary Medical Association’s Pet Dental Care page or the Pet Dental Care page on our website. ← Essential Oils: Feline Friend or Foe?